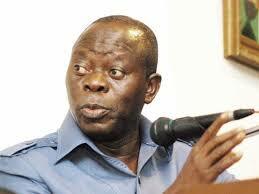 Nigerians need to accept that they need each other as no part of the country can do without the other, Edo state governor, Adams Oshiomohle said Wednesday. This is even as he appealed to the South-South region of the country to work together to end militancy and create a peaceful environment for investors, businessdayonline.com reports. Emerging from a meeting with President Muhammadu Buhari at the Presidential Villa, the governor said states in the South-South region must not yield to the blackmail of agitators as the unity of Nigeria was not negotiable. The region is currently witnessing renewed agitation of militants under the aegis of a group, The Niger Delta Avengers, that has gone on rampage in the oil rich Niger Delta blowing up oil and gas installations in the region. “I appeal to all of us in the South-South, we need to wake up, it is for our own self interest that we make the region the most investor friendly that even challenges that we face, the assets being destroyed is not just national assets, it is our own assets. It is what makes the south-south the hub of the Nigerian economy. “So if somebody for whatever reasons decides to destroy pipelines and thereby compounds the problem of pollution, the cost of cleaning up that area, making it attractive either for fishing, farming or other business is a huge cost. Cost not just naira and kobo, cost in terms of time and in terms of human lives. “What I can say is that this President deserves the support of everyone. For me, I believe in Nigeria, I believe no part can do without the other, I believe our unity is not negotiable, I believe the responsibility of the political elite is to strengthen the bridge of unity, to discourage preaching hatred, amplify weak points rather work to strengthen those points. “The sooner we accept this reality the better for all of us. The days of ethnic champions and imaginary divides will not help anyone. We don’t need to be security experts to accept the universal truth that wherever there is insecurity there will be no investment because no investor will go to where is unsafe. And where there is no investment poverty will be endemic because there will be no job for our people” the governor said. He said compounding the problem by breaking pipelines, stealing crude oil and destroying farmlands, destroying water ways, despite all of government’s intervention in the region would not benefit anyone.